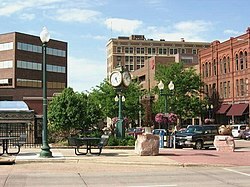 סוּ פולס (באנגלית: Sioux Falls) היא העיר הגדולה ביותר במדינת דקוטה הדרומית שבארצות הברית. Center for Western Studies‏‏ , כתובת: 2001 S. Summit Ave‏, ☎ +1 605-274-4007. Delbridge Museum of Natural History‏‏ , כתובת: 805 S. Kiwanis Ave‏, ☎ +1 605-367-7059. Northern Plains Gallery‏ (Sinte Gleska University‏), כתובת: 817 N. Elmwood Ave‏, ☎ +1 605-334-4060. Old Courthouse Museum‏‏ , כתובת: 200 W. 6th St‏, ☎ +1 605-367-4210. Visual Arts Center at the Washington Pavilion‏‏ , כתובת: 11th Street and Main Ave‏, ☎ +1 605-367-6000. Kirby Science Discovery Center‏ (Washington Pavilion‏)‏ , ☎ +1 605-367-6000. Sertoma Butterfly House‏‏ , כתובת: 4320 S. Oxbow Ave‏, ☎ +1 605-334-9466. USS South Dakota Battleship Memorial‏, ☎ +1 605-367-7141. Strawbale Winery‏‏ , כתובת: 47215 257th St, Renner, South Dakota‏, ☎ +1 605-543-5071. 43.5374-96.76481 Great Plains Zoo‏‏ , כתובת: 805 S. Kiwanis Ave‏, ☎ +1 605-367-7059. 43.558333-96.7222222 Falls Park‏  , כתובת: 309 E. Falls Park Dr‏, ☎ +1 605-367-7430. Sertoma Park‏, כתובת: 49th & Oxbow‏. Sioux Falls Storm‏‏ , ☎ +1 605 274-6686. Catfish Bay‏‏ , כתובת: N. Cliff Avenue & N. 64th Street‏, ☎ +1 605-339-0911. Great Bear Recreation Park‏‏ , כתובת: 5901 E. Rice St‏, ☎ +1 605-367-4309. Wild Water West Waterpark‏‏ , כתובת: 26767 466th Ave‏, ☎ +1 605-361-9313. Falls Park Visitor Information Center & Gift Shop‏, כתובת: 309 E. Falls Park Dr‏, ☎ +1 605-367-7430. 43.511111-96.7758331 Empire Mall and Empire East‏‏ , כתובת: I-29 & 41st Street‏, ☎ +1 605-361-3300. Leonardo's Cafe‏‏ , כתובת: 301 S. Main Ave‏, ☎ +1 605-731-2384. Phillips Avenue Diner‏, כתובת: 121 S. Phillips Ave‏, ☎ +1 605-335-4977. Hy-Vee Casual Dining‏, כתובת: 3020 E. 10th St‏, ☎ +1 605-336-8947. Nick's Gyros‏, כתובת: 1512 West 41st St‏, ☎ +1 605-335-1588. Johnny Carino's‏, כתובת: 2310 S Louise Ave‏, ☎ +1 605 361-7222. Sushi Masa‏, כתובת: 423 S. Phillips Ave‏, ☎ +1 605-977-6968. Taste Of India‏, כתובת: 1504 W. Russell St‏, ☎ +1 605-357-8000. T.C. 's Referee Sports Bar & Grill‏, כתובת: 5322 W. 26th St‏, ☎ +1 605-361-2208. Tea Steak House‏, ☎ +1 605-368-9667. 43.544476-96.7271191 Minerva's‏‏ , כתובת: 301 S. Phillips Ave‏, ☎ +1 605-334-0386. 43.501705-96.7717532 Spezia‏‏ , כתובת: 4801 S Louise Ave‏, ☎ +1 605-334-7491. Crow Bar‏, כתובת: 2805 S Minnesota Ave‏, ☎ +1 605-332-2981. Poppadox Casino & Pub‏, כתובת: 2808 S. Minnesota Ave‏, ☎ +1 605-336-8000. Wiley's Tavern‏, כתובת: Main Ave (downtown)‏. PAve‏, כתובת: Phillips Ave (downtown)‏. Center Inn‏, כתובת: 900 E. 20th St‏, ☎ +1 605-334-9002. Cloud 9 Motel‏, כתובת: 4904 N. Cliff Ave‏, ☎ +1 605-336-0650. Days Inn‏, כתובת: 3401 S. Gateway Blvd‏, ☎ +1 605-361-9240. Motel 6‏, כתובת: 3009 W. Russell St‏, ☎ +1 605-336-7800. Microtel Inn & Suites‏, כתובת: 2901 S. Carolyn Ave‏, ☎ +1 605-361-7484. Red Roof Inn‏, כתובת: 3500 S. Gateway Blvd‏, ☎ +1 605-361-1864. Rodeway Inn‏‏ , כתובת: 4208 W. 41st St‏, ☎ +1 605-361-2345. Sleep Inn‏‏ , כתובת: 1500 N. Kiwanis Ave‏, ☎ +1 605-339-3992. Super 8-Cliff Avenue‏, כתובת: 4808 N. Cliff Ave‏, ☎ +1 605-339-9212. Super 8-East 10th‏, כתובת: 2616 E. 10th St‏, ☎ +1 605-338-8881. AmericInn Motel‏, כתובת: 3508 S. Gateway Blvd‏, ☎ +1 605-361-3538. Baymont Inn‏, כתובת: 3200 S. Meadow Ave‏, ☎ +1 605-362-0835. Best Western-Empire Towers‏, כתובת: 4100 W. Shirley Pl‏, ☎ +1 605-361-3118. Best Western-Ramkota Inn‏, כתובת: 3200 W. Maple St‏, ☎ +1 605-336-0650. Comfort Inn-South‏‏ , כתובת: 3216 S. Carolyn Ave‏, ☎ +1 605-361-2822. Comfort Suites‏‏ , כתובת: 3208 S. Carolyn Ave‏, ☎ +1 605-362-9711. Fairfield Inn‏, כתובת: 4501 W. Empire Pl‏, ☎ +1 605-361-2211. Holiday Inn Express‏, כתובת: 2501 S. Shirley Ave‏, ☎ +1 605-361-0122. Homewood Suites‏, כתובת: 3620 W. Avera Dr‏, ☎ +1 605-338-8585. Quality Inn & Suites‏‏ , כתובת: 5410 N. Granite Ln‏, ☎ +1 605-336-1900. Ramada Inn Limited‏, כתובת: 407 S. Lyons Ave‏, ☎ +1 605-330-0000. Ramada Inn & Suites Airport‏, כתובת: 1301 W. Russell St‏, ☎ +1 605-336-1020. Super 8-41st Street‏, כתובת: 4100 W. 41st St‏, ☎ +1 605-361-9719. Courtyard‏, כתובת: 4300 W. Empire Pl‏, ☎ +1 605-361-2211. Clubhouse Hotel & Suites‏, כתובת: 2320 S. Louise Ave‏, ☎ +1 605-361-8700. Hampton Inn‏, כתובת: 2417 S. Carolyn Ave‏, ☎ +1 605-362-1700. Holiday Inn Express & Suites Empire Mall‏, כתובת: 2501 S. Shirley Ave‏, ☎ +1 605-361-0122. Holiday Inn Express & Suites Sioux Falls Southwest‏, כתובת: 3821 W. Avera Dr‏, ☎ +1 605-275-4155. Holiday Inn City Centre‏, כתובת: 100 W. 8th St‏, ☎ +1 605-339-2200. Residence Inn‏, כתובת: 4509 W. Empire Pl‏, ☎ +1 605-361-2202. Sheraton Sioux Falls & Convention Center‏‏ , כתובת: 1211 West Avenue North‏, ☎ +1 605-331-0100. TownePlace Suites‏‏ , כתובת: 4545 W. Homefield Dr‏, ☎ +1 605-361-2626. ↑ Station Name: SD SIOUX FALLS. National Oceanic and Atmospheric Administration. אוחזר ב־2013-03-10. ↑ NOWData - NOAA Online Weather Data. National Oceanic and Atmospheric Administration. אוחזר ב־2013-02-18. ↑ Average Weather for Sioux Falls, SD − Temperature and Precipitation. The Weather Channel. אוחזר ב־2010-05-14. ↑ Climatological Normals of Sioux Falls. Hong Kong Observatory. אוחזר ב־2010-05-14. דף זה נערך לאחרונה ב־22:54, 17 בדצמבר 2018 על־ידי משתמש ויקימסע ויקיג'אנקי. מבוסס על העבודה של משתמש ויקימסע DekelEBot.